if i had to find happiness in any dress in the world it would be this one! it's definitely my vintage dream dress and just happened to fit me like a glove...i swear that it was meant to be, eeeeeppp i just love it! and my darling bow heels and sweet as can be sally hansen sticker nails just gave it the daintiest touch! hope you have an enchanted weekend! Oh these photos are so lovely! You look SO SO SO beautiful! 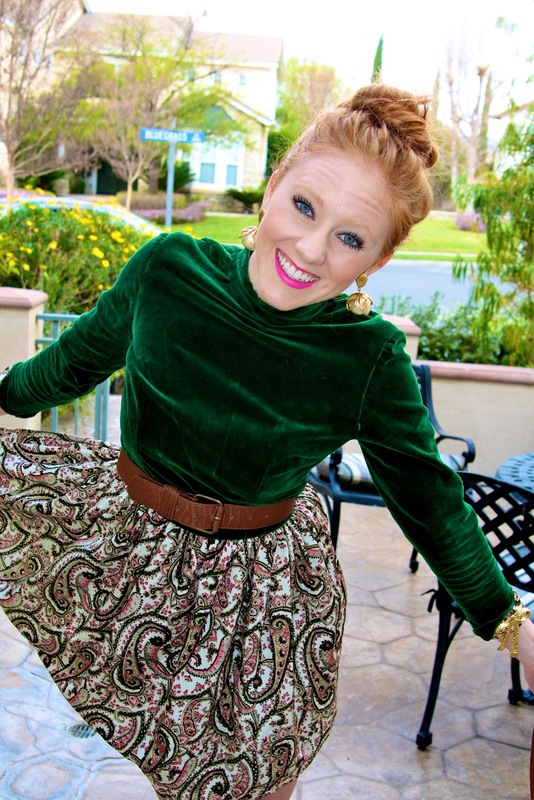 I adore the color of your hair with the green velvet top! The shoes are pretty amazing too! LOVE LOVE LOVE! The green complements your skin tone very well.I love this look! omg amazing outfit! you look gorgeous! you rock that dress, kaitlin! and those shoes are just perfection. wow you look so fabulous! we are loving this outfit from head to toe! So divine!I adore this look! the dress is gorgeous but the shoes are perfect! love the outfit so much! Holy eff. I love this! And I love your blog! So glad I stumbled across this!! Oh my goodness! How cute are you?!! Love the green on you, its goes amazingly well with the pink lipstick! And those nails!! Ahhh! Pretty outfit! We really love its style! You look like you should be in that movie "Enchanted" with this dress. It is gorgeous! that dress truly is a fairytale and it looks extra chic with your hair color! can I just say that I think you are probably the only person I know that can pull off a green, turtleneck, velvet dress....and look so beyond fabulous!! your bun is perfection, and I just love the details on the dress!!! it does fit you like a glove!!! That dress is totally perfect. gorgeous outfit!! glad you had such a nice Valentine's Day :) & your hair colour is so nice..I love it! LOVELY. I love that dress, those shoes, your nails. I love all of it. All of it, is so gorgeous. So stunning. Velvet always gets me excited. loving your blog... oh and did you know you have my dream hair color! Lovely lovely photos! You look so cute, and your hair is beautiful! my fav my fav my favourite dream dress of yours!!!!!!! no question that it's really classy, vibrant and fun at the same time. This dress is gorgeous!!! Love it with that bright pink lip color!! wow your eyes are really amazing! and i love your nails, so pretty, so refreshing. First, you're beautiful. I love the velvet top. The way you styled your hair and THOSE SHOES! I am swooning over those shoes. Second, your blog is adorable! Thirdly, what kind of lipstick are you wearing?! love everything u wearing from head to toe!! and those nails *gasp* LOVE IT! lovely shots and an adorable dress! your pictures are so wonderful, the dress is sooo pretty! The top lends the Hansel and Gretel vibe. Very nice outfit. Thanks for posting the photos and feel free to drop by me too when you have time. That dress is such a vintage dream! I am loving the forest green and the styling on this is perfection. Beautiful. By far my favourite look of yours so far! That green is stunning on you with your beautiful red hair, and I love the nails! This is a very nice outfit. It is adorable and screams with fun!I love it! 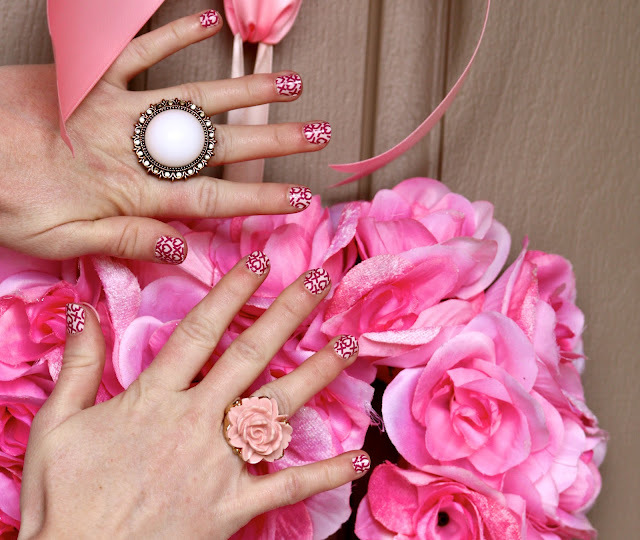 Your rings and nails are amazing too! How did I miss this amazing post? What a stunning dress, the print is lovely! U have gorgeous eyes, but this emerald green makes them even more prettier!!! :) Adorable look!! Very beauriful outfit! the color combination and the materials.... Everything is good! Loving the Blog! Do you love vintage wear? If so, Shop Elegant Pieces for beautiful vintage clothing and handmade jewelry!!! Stay fab chica! You look gorgous! I have always wanted to have a red hair. It's perfect. Also you have such an amazing eyes. The green colour looks perfect on you. Also the skirt pattern works well with the shoes. I'm happy that I found your blog. I'm definitely a new follower. Could you please check my blog and possibly follow it? I'd appreciate it a lot.